In my last post I wrote about realizing once and for all that I have to let go of this fear that is paralyzing me. It got me thinking about how hard it is going to be to just shut down all of my fears. I know it’s not something that can happen overnight. I’ve had this fear lying inside me for so long whether it was fear of not succeeding or fear of actually being successful. I’ve been stuck in this comfort zone, which is odd that they call it that because it’s not actually comfortable to be stuck. It’s not that I like how things are right now, or the lack of progress that I am seeing in my business. But there is a sense of comfort in already knowing how things are going to go. But I don’t want to live in the land of comfort anymore. I want to push the envelope and challenge myself. I don’t want things to be hard but I don’t want things to be completely easy either because I want to set higher bars for myself and rejoice when I meet them. Comfort-ability is great for a moment but it will never sustain you on your journey to your dreams. There needs to be a shift in my life and I have to commit to this shift, this change and stay on track. I keep getting off the path because I see repeated stops to the land of comfort and on the surface it’s appealing. 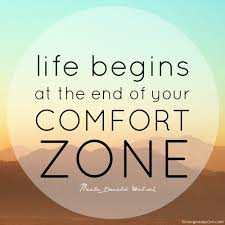 In the comfort zone there are no high expectations to be met anymore. You’ve reached your current maximum potential and while it is a celebrated thing to do so, it also stirs a bit of inner conflict. You’ve reached the initial bar you set for your goals so do you maintain those particular goals and unintentionally become stagnant or do you see that bar, raise it higher once you’ve reached it, and push through until you reach the next level of your journey. I think that I inadvertently chose to stay stagnant but it most certainly was never my intention to. I know that to reach my very big dreams that there are a lot of little goals that have to get accomplished along the way. I also realize that I can’t let fear of change whether it’s good or bad, stop me from moving forward and making progress. Change requires some manner of discomfort because you are going into the unknown. However, a change in direction could be more rewarding than staying on the road you’re most comfortable on. Being comfortable doesn’t get you anywhere close to you destination. It can only really hold you in place as your dream moves further away.